I'm so grateful to Strawberry in Manhattan Mall for stocking fun, inexpensive, and very stretchy graphic T's ($12.99). I like how you can't see where the T shirt ends and where the black "leather" paneled dressing room begins. Instead of wearing T's that say "Baby on Board" and such, I prefer the psychedelic neon paint drips. There were also some Necessary Objects boyfriend jackets, for those of you who haven't hopped on that trend yet. A good fit and a great deal at $46.99. The Berry's accessories department in Manhattan Mall is also quite impressive. There's a 3-for-$15 leggings sale, loads of sandals, and fun stockings. I even saw tattooed, slip-on sleeves but can't find the picture of the mannequin wearing them. They totally made me do a double-take. Tragic, perhaps, but they seemed like something good to have in your sock drawer. You never know when you'll need a fake tattooed sleeve. I LOVE that brightly colored one! Very flattering! 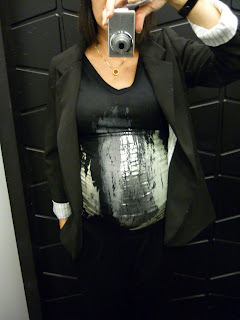 These are a far more fashionable way to draw attention to the bump than a "Baby on Board" tee! I have to say that I'm really a big fan of Strawberry. They're my quick fix fashion hit. Pourquoi pas? I love that splatter paint black tee. So hip.